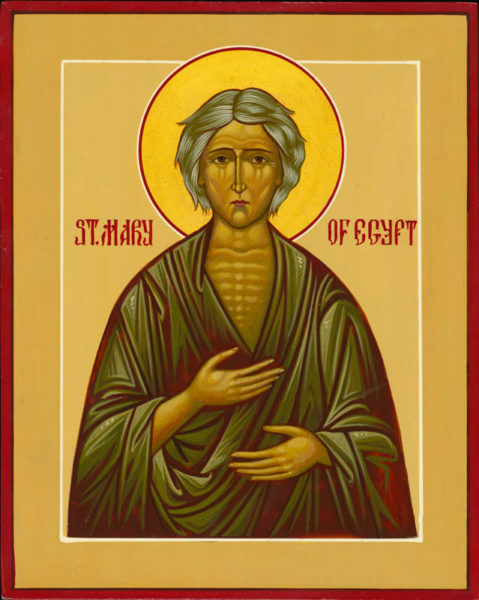 This Sunday of the breathtaking life of Saint Mary of Egypt is commemorated and presented to us sinners as an example of heroic hope in the mercy of the Lord and the heights it can raise us to. The boundlessly sinful woman who took all in lust now boundlessly gives herself to Love. Our unity with Christ is a wedding that gives life, rather than take away. She exemplifies the beauty of Catholic sexuality, and in that light sheds even greater light on the “no-no’s” of the Church that everyone in their worldly thinking sees as discrimination. We don’t look at the No’s as if they were the meaning of our life. We don’t look at what we must not do but what we should be doing and always in better ways! Fear of death is an imperfect way of avoiding sin (just as in Confession’s contrition). It is LOVE that must draw us to God, and naturally this means away from any disfigurement (sin) of His Image in us and the beauty of His works. Saint Mary reflects the harrowing difference between a sterile taking away of someone else’s treasure for our pleasure (her previous life) vs. the fertile and life-giving love that draws us out of ourselves to give this self to another as the height of our Matrimonial unity. The Catechism of the Catholic Church speaks of Matrimony’s purpose as being two things: to get yourself and the other to Heaven, and participating in God’s creating act by making souls for Heaven. It doesn’t talk about “he’s handsome and I get butterflies” or “she’s pretty and I like her”. These are natural feelings and beautiful in the right place. However, to follow them as the primary source and goal of our sexual love is a blasphemy against the Sacrament of Matrimony and our Crowning as mutual martyrs for the sake of Love. It is like saying “I am not a Christian, I see the Eucharist, I don’t think about God but I receive Him because the Host tastes good.” What a blasphemy and a sorrowful misunderstanding of the treasure unfolding in the Sacrament!